Centipedes are found throughout the United States and are typically found in areas of high moisture including piles of leaves and grass, under stones, and rotting logs. 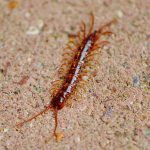 Once inside homes, centipedes are typically found in bathrooms, potted plants, crawlspaces, damp basements, and other sites typically infested by pests. Adult centipedes hide in moist, dark and secluded areas during winter. Centipedes may enter houses and buildings, but they are nocturnal and do not roam during daytime. At night they are active hunting spiders and other insects. Reduce any clutter on the inside and outside of your home. Clearing up clutter on the floors inside will force centipedes to find another hiding place. Outside, keep trash, rocks, leaf litter, grass clippings, firewood, compost, and building materials cleaned up or away from the perimeter of the house. Centipedes like to hide in ivy growing on the sides of homes and buildings. They feed on other insects within the home, so proper control of those pests will reduce the probability of a centipede infestation.